Focus Products of Lincolnshire, IL, is voluntarily recalling Cocoa Latte Hot Drink Makers because a small bushing inside the container has the potential to leach lead. To date, Focus Products has received no notice of any consumer complaints. However, the company’s independent testing revealed the potential problem, and out of an abundance of caution, the company voluntarily decided to recall the product. The only affected products are the Cocoa Latte Hot Drink Makers, makes and model numbers listed above. The Cocoa Grande™ Hot Drink Maker is NOT affected by this recall. 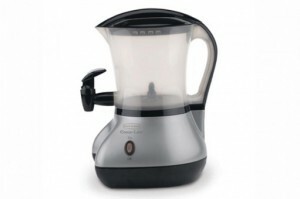 The Cocoa Latte Hot Drink Makers shipped nationwide starting in 2004 through October 12, 2012. The affected products come in a variety of colors with transparent pitchers, and were sold primarily in the United States through various retailers such as Bed Bath & Beyond, through various e-retailers such as Amazon.com and through Focus Products’ online store.